Although it can take up to 30 years to pay off a mortgage, there’s no rule that says you have to spread this debt over three decades. An “estimated 20 million Americans own their homes outright,” reports Dave Ramsey, author of the best-selling book The Total Money Makeover. And if you’re looking to join this club sooner rather than later, adjusting the way you pay your mortgage can get rid of the loan quicker. Now, this achievement may appear to be a far-off dream, but there are practical ways to make it happen. 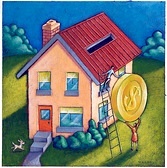 Paying one half of your mortgage payment every two weeks can shrink your term by six or seven years. Given how there are 52 weeks in a year, bi-weekly payments result in 26 half payments – the equivalent of 13 full payments or one extra mortgage payment a year. Although a seemingly insignificant move, this extra mortgage payment decreases the amount of interest you owe over the life of the loan, and ultimately shortens the length of your mortgage term. Unfortunately, a bi-weekly schedule isn’t something you can do on your own. You’ll need to get permission from your lender to switch to a bi-weekly payment schedule, and most banks charge a one-time setup fee. A bi-weekly mortgage is an effortless way to pay down a mortgage faster, but not all banks offer this option. If your lender doesn’t allow this pay schedule, you can still pay off your mortgage early by sending one extra principal payment a year. There are different approaches for submitting the extra payment. You can make a double mortgage payment once a year, and specify on the payment coupon that you want the extra amount credited to the principal only. Another option is increasing each mortgage payment by 1/12, which might be more manageable than a double mortgage payment. Simply divide your regular payment by 12 months and then add this extra amount to each future payment. If you’re only a few years into a 30-year mortgage term, refinancing to a 10 or 15-year mortgage is another strategy for paying off a home sooner. Shorter terms increase how much you pay on a monthly basis, but the increase may not be as high as you think. Some people mistakenly assume that cutting a mortgage term in half will double their mortgage payments. However, shorter repayment periods typically justify a cheaper interest rate, and this lower rate can translate into surprising savings. To illustrate: a $200,000 mortgage for 30 years with an interest rate of 4.25% comes to $983 a month, excluding taxes and insurance. If you take the same mortgage and reduce the term to 15 years, you might qualify for an interest rate of 3.29%. Based on the second scenario, you’re looking at a mortgage payment of $1,409 – a difference of just $426 a month. How you spend your disposable income is entirely up to you. And while you can probably think of a million other uses for the extra income, paying off your mortgage early has one undeniable, priceless benefit – peace of mind from knowing that you own the property free and clear.